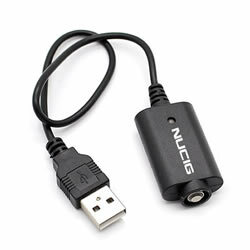 Screw connect your NUCIG ULTIMATE PRO variable voltage battery into this cable and connect for charging to USB port found on PC computers, laptops, playstation consoles etc or via mains to USB plug. Rapid charging, flexible cord - carry with you very easily. Great service as usual from nucig.